You will be receiving an email any moment. Cards will be distributed to the applicant ONLY. Print and bring with you the attached confirmation and show it to the cashier during your next visit. You will be given your card with 1 punch for an authorized visit and an additional punch for signing up online. Show the cashier the confirmation you received on your tablet, laptop or cellphone. You will be given your card with 1 punch for an authorized visit and an additional punch for signing up online. 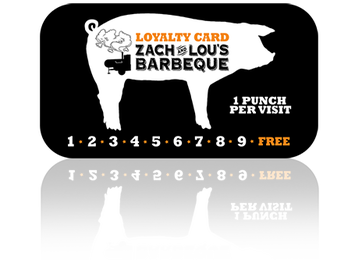 Thank you for eating at Zach and Lou's Barbeque!